You stopped walking your dog. You can’t risk him attacking another dog, or biting a person. But alone, around you he is a wonderful dog. He doesn’t deserve this. We do not hire, and mentor junior trainers to work with you. You are not benefiting if the behavior consultant is not qualified enough to be certified, or passes you off to a junior associate. We do not interested in signing up as many cases as possible. Certified Behavior Consultant, Suzanne Wiebe, personally handles ever behavior case. Anyone can say they are can handle behavior cases, but unless they have extensive knowledge of cognitive, medical, and chemical imbalance problems dogs have then you are only using ‘program’ fixes. There is no intake, assessment, or therapy provided. Certification is the least difficult process, and very affordable. There is nothing to stop a ‘qualified’ individual from becoming certified. Suzanne Wiebe is not only certified, her workshops are recognized and qualify for CEUs to help other trainers and behavior consultants improve their skills. Phone/Skype Consults: Not everyone needs a program. We help many people via phone or skype, video, and education. If you feel that you will benefit from a phone consult please email info@sportdogtrainingcenter.com with your name, phone number or skype ID, and when would be a good time to arrange a contact..
Why Does My Dog Act Like This? If you don’t understand the problem then we suggest you read our blog, staring with this post called Canine Aggression: Predict, Prevent, Protect. This is the foundation of our successful canine transformation programs. The problem with reactive dogs is that the problem is in how they see the world. They fear things that shouldn’t be feared. Unfortunately, traditional training makes the problem worse. Even teaching the ‘look’ and ‘leave it’ commands leaves does not change the behavior. What we need to do is reprogram your dog so that it can relax and enjoy life. Reducing stress and allowing you to enjoy a well-behaved, healthy dog! Reactive Dog Workshop: Every client is welcome to the 2 hour workshop. You may bring 1 guest. Or, if you would like to see the workshop before committing to our program then the cost is $30. If you sign up we deduct the workshop fee from your program. Please call 519 902 4739, or fill in the following form if you want more information, or if you are ready to register. Please phone if you do not receive a response within 6 hours. 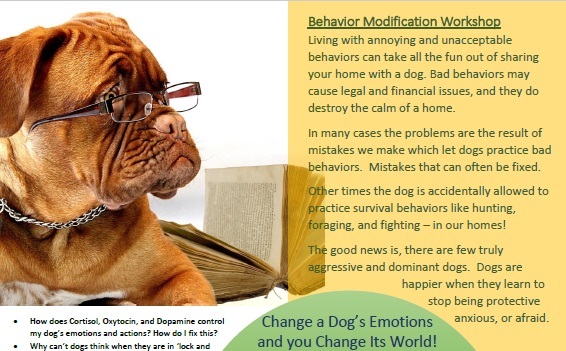 Next workshop: April 2018 Click Here to Download the behavior-modification-workshop-flyer Workshop is $30, or free if you are taking one of our courses. Please sign up for more information and dates. Step #1: Do You Want a Behavior Assessment ? We cannot predict how long it will take to fix a problem. We’ve had people come to us with dogs they were ready to euthanize – and leave 45 minutes later with a new dog. We’ve also had dogs we worked with for 4 months before seeing a substantial break through. We will be honest. We will not work with a dog unless we are sure that it can be controlled. We will also work with your veterinarian to ensure the problem is not medical. We do guarantee that we will offer 100% transparency, and will not continue working with a dog if we do not have at least 80% expectation of achieving a level of succes s that enables you to live peacefully, and safely with your dog. The following programs are designed to give you the skills needed to manage reactive problems and work with your dog to stop the problems. 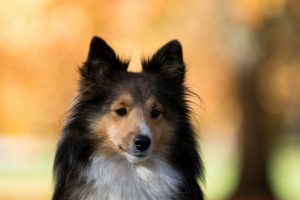 Note: A behavior assessment is a tool that helps people identify their dog’s triggers and establish a training and management program designed to improve your life, and keep you and your dog safe. The assessment will highlight risk factors, and make suggestions to keep you, and your family safe. We do not tell you whether to rehome, medicate, or euthanize a dog. We give you the information needed to make an informed decision. This is not a tool to prevent legal action. In Ontario the dog owner is 100% financially and legally responsible for any damage done by their dog. If charges have been laid then your best action is to contact a lawyer. Once you do that, if you need help teaching your dog to stop biting then please call us. Max 4 dogs in class. Each dog is in its own ‘area’ with fencing around. We have fencing, curtains, and other tools to keep dogs safe. No dogs who bite humans. This program is for dog-dog aggression only. If your dog is human reactive then we offer private classes. *This class is designed to empower owners and help build coping skills for the dog. It is not behavior modification and at least 50% of all dogs will need more help after this class. We teach you to change your dog’s behavior. We teach you to manage with 1 behavior/Trigger in these sessions. 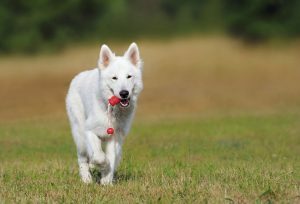 We will work in a safe environment to increase control and trust between you and your dog. Most people have enough control walk their dog in public. If you do the work asked, your dog will focus on you. 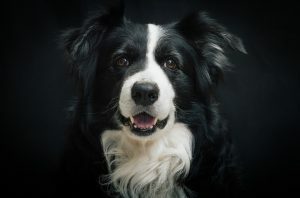 You will have the skills and techniques needed to continue with the program so you can enjoy having your dog around. We keep this program short and simple to reduce the cost. Once you’ve finished the course you can continue to work with other people who have high drive or hyper dogs, you can come to socialization sessions for only $12. This is to continue practicing. This is more cost effective than keeping you in a program for 8-10 weeks. 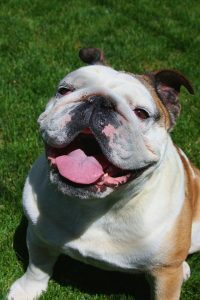 Positive Transformations – Dogs with a bite history, or who bully their families, or have difficulties learning. Note: This is not a training course. Most people come weekly for 6 sessions. Then they work at home, and return for another session when their dog is ready to move on. Each session works on specific issues that affect your dog’s actions/reactions. Not all dogs need multiple sessions. If you are unsure, talk to us, or book an assessment. Session #1: Dealing with the emotional and chemical response to stress, and fear. Session #3: Preventing future problems, increasing reliability and safety for dogs around children or in high activity environments. This is a private class. We start and set the schedule for when it fits your schedule. We work with you and your dog. You’ll learn how to work at home to manage your dog’s reactions and outbursts. In this program we increase the triggers in a safe environment. We then start public access work so that you do not need to spend the rest of your life walking your dog at midnight, or booking the last vet appointment of the day. We do not guarantee that your dog will have no triggers. What we do work towards is creating a teamwork relationship where you and your dog can function. 10 sessions x $400. The first 6 are weekly. The last 4 are when your dog is ready. We don’t want to hear of fear, withdrawal, PTSD, anxiety when we talk about rescued dogs, but they are an every day part of life for some of these dogs. Many of them have endured horrible conditions before you rescued them. Many of these dogs fear people. They bite, even the ones they love. Their behavior is unpredictable. Nothing makes sense. You’ve tried everything. You cannot ‘train’ a few tasks and hope that deals with the deep emotional and mental trauma. You cannot hope that all problems will be resolved in 8 weeks. However, we have helped many rescued dogs overcome fear, anxiety, and aggression. Our average successful therapy candidate has recovered in 8 – 20 weeks. This program can give you and your dog the skills needed to enjoy life and create a safe environment at home or when in public. For dogs with aggression problems but no intent to harm. We do offer private in home classes behavioral training to anyone within 1 hour of Aylmer Ontario. We do go beyond these boarders in certain situations. These are the only options for people who need us to help train their dog. Priced per hour. Note: These are not obedience courses. They are designed to help you manage your dog’s behaviors so you can protect your dog, and everyone your dog encounters. All dogs who are a threat to another dog or person must wear a muzzle when outside of the Quonset hut. The owner agrees to disclose any possible threat to the trainer, immediately. Any dog threatening or endangering another dog will be removed from the building until the problem is resolved. Anyone who uses punitive measures, or uses fear or pain for training will be asked to leave the premises. No refund is offered as we will not be able to fill their space. The trainer’s first responsibility is to the care and safety of all dogs present. Like all therapy for trauma, addiction, and chemical imbalances (even in humans) we cannot guarantee success. We may suggest veterinary intervention, chiropractic, diet, massage therapy, and/or physiotherapy.